Government is working on safety nets to shield vulnerable members of society against price distortions on basic commodities and will soon unveil a well-packaged strategy to ensure goods reflect their real value, Vice President Kembo Mohadi has said. 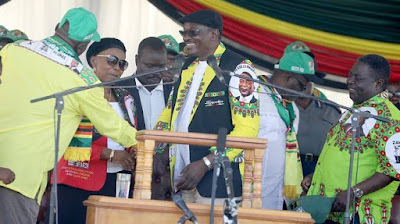 VP Mohadi was speaking at Zanu-PF’s second post-election Thank-You Rally at Mt Darwin High School, Mashonaland Central province, yesterday attended by thousands of supporters. He said it was worrying that Zimbabwe had over 35 000 civic organisations, most of which were engaging in underhand political activities designed to effect regime change. He stood in for President Emmerson Mnangagwa. VP Mohadi said authorities were crafting a cocktail of measures to ensure availability of basic goods at fair prices, including extensive support for retailers. “Basic commodities like cooking oil, sugar, salt, rice, mealie-meal, milk and flour; the prices are being looked into so that they become affordable to the generality of the public. Government is equally putting in place loan facilities for retailers who will maintain cheap prices. Government would also work with industry in implementing the basic commodities price stabilisation initiative. VP Mohadi said the basic commodities programme was aimed at providing relief to the public in the same manner as the recent introduction of buses for urban commuters. He told the gathering that more buses were being mobilised to provide cheap transport in rural areas. “There are 500 buses that will be coming from Belarus and another 200 buses from South Africa. The resuscitation of Zupco was long overdue,” he said. VP Mohadi said NGOs would not win in their attempts to destabilise the country, despite their huge number. “There are 35 000 NGOs in Zimbabwe. It is such a high number for a very small country such as Zimbabwe. They are more than our own national army. We do not know what they are looking for. They claim to be non-Governmental, but in reality they represent foreign governments that have intentions to take over the country. Vice President Mohadi, who is also Zanu-PF Second Secretary, said the country’s strategic grain reserve had enough stocks to provide food security for seven months. He said harvest from the 2018-2019 agricultural season would boost the stocks. “I am aware that here in Mashonaland Central there are some areas that are drought-prone. I can assure you that no one will die of hunger anywhere in the country. Minister Perrance Shiri is in charge of agriculture and every Tuesday he briefs Cabinet on the food security situation while the Minister of Public Service, Labour and Social Welfare is in charge of the distribution of grain. We have enough grain to last the next seven months.” Government planned to build more hospitals countrywide and increase the number of cancer screening centres, he said. Government would also build more schools with requisite learning material and infrastructure. The Vice President thanked the people in Mashonaland Central province for resoundingly voting Zanu-PF in last year’s elections. “You demonstrated loyalty and commitment to Zanu-PF. You demonstrated unparalleled patriotism as you supported President Mnangagwa. We will remain grateful,” said VP Mohadi. He paid tribute to the late national hero and music icon Dr Oliver Mtukudzi who hailed from the province. In her address, Zanu-PF national chairperson Cde Oppah Muchinguri-Kashiri said Mashonaland Central was a resolute pillar of Zanu PF with a strong bond to the liberation struggle.